Today – 20% chance of storms. 82°, west-southwest wind 10-15 MPH. Tonight – 20% chance of storms through midnight. 59°, southeast wind 5 MPH. Tomorrow – Mostly sunny. 82°, west wind 10-15 MPH. A low pressure trough moves toward the Colorado River Valley today. This feature interacts with enough moisture to trigger isolated storms this morning through the evening hours. Areas north of a Tucson-Willcox line stand the best chance of seeing storms, while towns south of the metro stand a slight chance. Highs this afternoon reach the low 80s, with overnight lows dropping to the upper 50s. Storm chances decrease after midnight. Mid to late week looks blustery as a storm system passes north of the state. Expect 20-25 MPH gusts Wednesday through Friday under mostly sunny skies. Daytime highs through the weekend remain in the 80s. High pressure is slated to arrive by Mother’s Day, supplying sunny skies and high temps in upper 80s. What do you get when you capture virga, a rainbow & Pusch Ridge glowing? The honors for today’s “Sky Candy”. Thanks to viewer Lynn Sharp from Oro Valley for snapping this dandy last night. This morning, I mentioned it was unlikely Tucson would see showers this weekend. I wasn’t seeing computer model consistency (some models said yes, others no). Also, moisture values in our atmosphere didn’t look all that impressive. Then came the 12Z model runs. A weak shortwave trough kicks through the state Saturday. Nearly all short-range computer models suggest enough moisture to fuel a few isolated showers develop along and east of an Oracle-Tucson-Nogales line. It’s far from a sure thing, but I have introduced a 10% chance of showers to your Saturday afternoon forecast. Those odds bump up to 20% for Cochise, Graham and Greenlee Counties. Rainfall amounts should generally be under 0.10″. A few places in the higher terrain maybe see a bit more than that. Cancel the BBQ? Absolutely not. Dig the umbrella out of the closet? Might be a good idea. Today – Mostly sunny, warm. 95°, west-northwest wind 10-15 MPH. Tonight – Mostly clear. 64°, southeast wind 5 MPH. 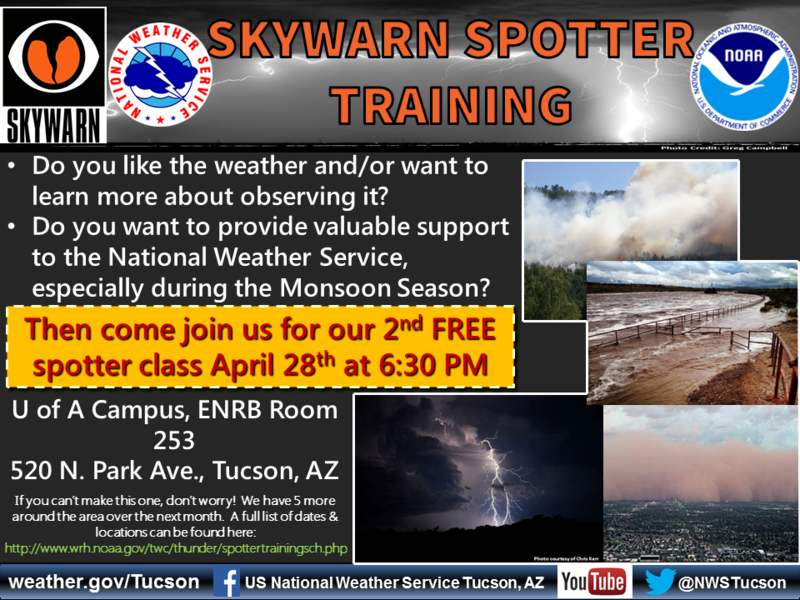 Tomorrow – Partly cloudy, maybe a sprinkle. 92°, WSW wind 10-15 MPH. Mid 90s on tap again, but next week looks unsettled. High pressure over New Mexico supplies daytime highs 8-10° above average today. If Tucson reaches the forecast high of 95°, it would be the 2nd straight day with temperatures achieving that mark. Mostly sunny skies prevail across southern Arizona. A weak trough slides across the state this weekend. This may touch off a few showers into the mountains east of Tucson Saturday and Sunday. Early next week features a stronger storm system approaching from Baja California. Isolated showers are possible for the valley floors Monday afternoon, with a better chance of rain & gusty winds early Tuesday. Temperatures for the first week of May will take a tumble. Much of next week should see Metro Tucson peak in the low to mid 80’s. 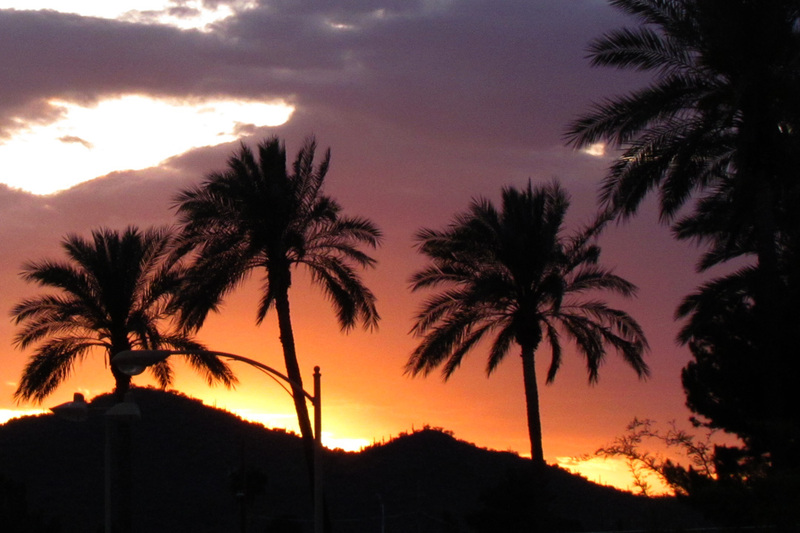 ICYMI – My post on all you ever wanted to know about 100° in Tucson. May come in handy for our Ice Break contest! Today – Sunny, warm. 95°, northwest wind 5-10 MPH. Tonight – Clear. 62°, southeast wind 5 MPH. Tomorrow – Mostly sunny, warm. 95°, west wind 10-15 MPH. 93° is the warmest daytime high thus far in 2015. There’s a good chance we’ll best that this afternoon. High pressure parks over the Grand Canyon State. In response, daytime highs run 8-10° above average today & tomorrow. Metro Tucson reaches the mid 90s under sunny skies. Western deserts have an outside shot at hitting triple digits for the first time this year. A slow cooling trend commences this weekend into early next week. Models continue to show a cold front sweeping across the state, dropping temps to the 80s & increasing winds by Monday. There is a slight chance of a few showers late Monday into early Tuesday, mainly along and north of a Tucson-Willcox line. Breezes ease up next Wednesday with highs in the low/mid 80s in the Old Pueblo. 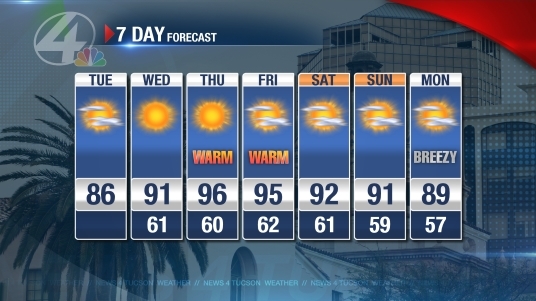 When do you think Tucson will hit 100° for the first time this year? Guess the date and time in our Ice Break contest & you could be heading off on an Alaskan cruise! Click here to enter. Today – Sunny, breezy early. 91°, east wind 10-15 MPH. Tonight – Clear. 61°, southeast wind 10-15 MPH. Tomorrow – Sunny, warm. 96°, north wind 10 MPH. The 90s return to the Old Pueblo. High pressure parks over the desert southwest. This feature is the catalyst for the warmest stretch of weather we’ve seen so far in 2015. Expect low 90s for highs this afternoon under sunny skies. East winds this morning peak around 20-30 MPH, but weaken during the afternoon hours. 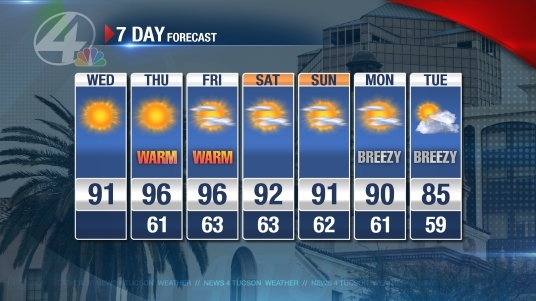 The mercury climbs to the mid 90’s across Metro Tucson tomorrow and Friday. Western desert of Pima County have an outside shot at hitting 100° for the first time this year. This includes the towns of Ajo and Sells. Models continue to hint at a slight cooling trend heading into the weekend & early next week. An approaching storm system increases wind speeds Monday, followed by partly cloudy skies Tuesday afternoon. 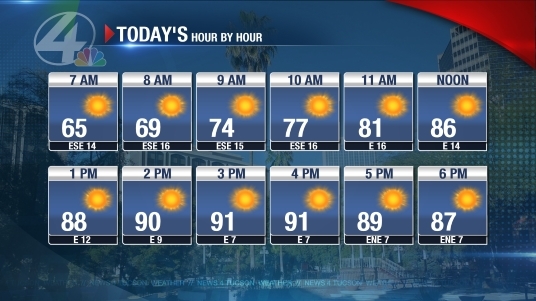 Highs Tuesday reach the mid 80’s in Tucson. 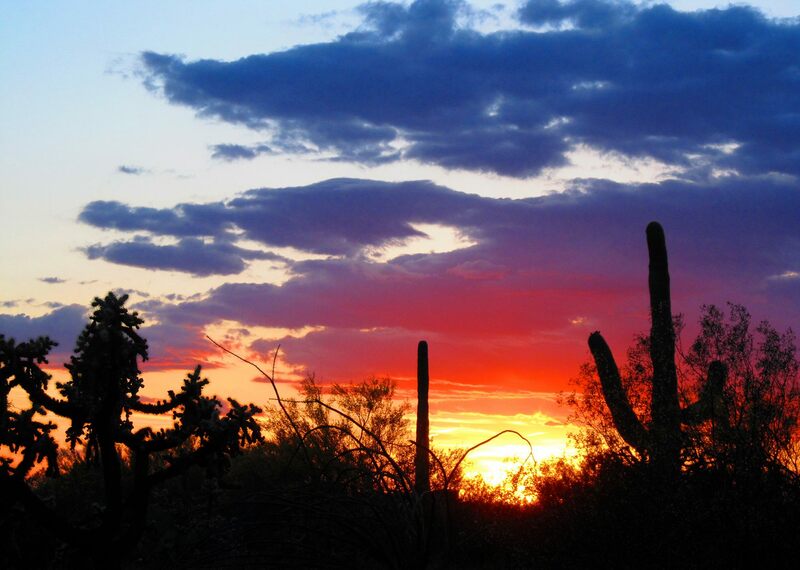 Lovely sunset from Tucson’s west side over the weekend. 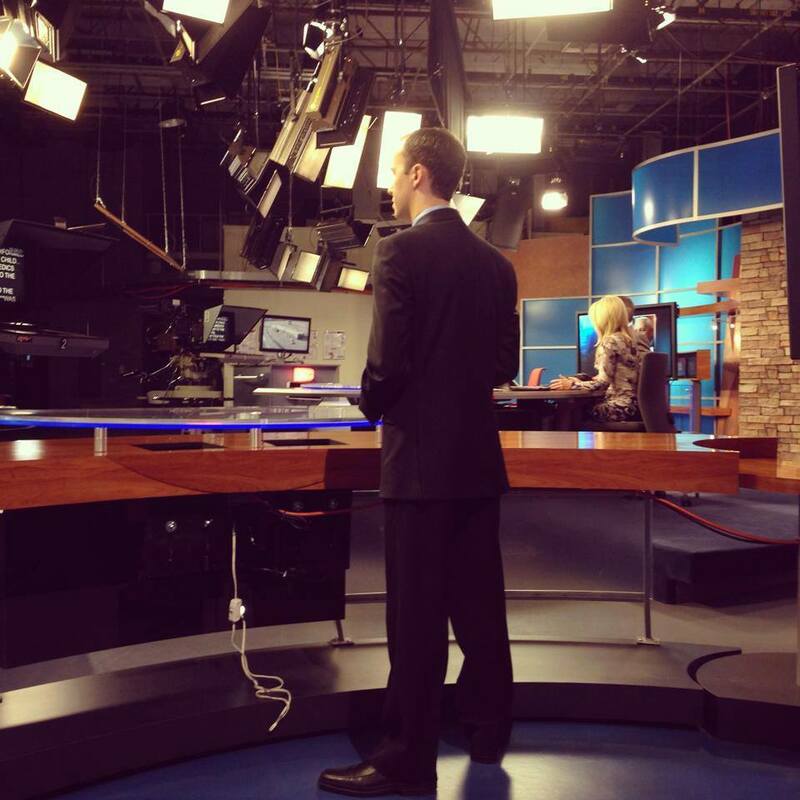 My thanks to viewer Alan Krasofski for posting to my Facebook page. Today – Mostly sunny. 86°, east wind 10-15 MPH late. Tonight – Clear, breezy. 61°, east wind 15-25 MPH. Tomorrow – Sunny. 91°, east-northeast wind 10-15 MPH late. Gorgeous Sunday sunset over Tucson Estates. Thanks Bob Pillsbury for sharing!